Hi all, I thought I'd set up a workbench thread seeming as I've now gotten into the swing of "cut and shuts" and repaint jobs. Firstly, is my recently completed freelance loco based around the Bachmann Junior saddle tank. I started off this conversion by removing the body, so that I was left with just the chassis and running plate. I then removed what were the back buffers and put in their place two whitemetal LMS buffers, spare from my Dean Sidings Lochgorn tank kit. Then, I added sandboxes, also spare, into the two holes left from where the lugs from the body would have gone. Next, I removed the splashers, and proceeded to add on a set of steps from a busted hornby S&DJR jinty. I originally had all four steps from this body shell glued onto the running plate for the newbuild, however the thinner ones at the front kept bowing and falling off, so they were discarded. Work then moved onto the tender, which was purchased from Ebay. This was a simple repaint of the body top, and painting of the frame sides, and axleboxes. Next, I bored out the hole a small bit to negotiate the new tender drawbar from the engine to tender. This was made from two off cuts of sprucing from other kits I had lying around. Then came the fun part - the engine's body. I'd purchased a Dapol schools class kit from a model railway show, with the intent of using it as the engine's bodyshell. This required a lot of hacking away, until I was left with the smokebox, firebox, and a small amount of the boiler. these were crudely glued together, and then, once the cab had been built, with the lower parts from the cab sides cut off, the whole thing was put together, and filler was then used to cover the rather large gaps from my cack handed sawing method. I then negotiated the now completed body onto the running plate, with the chassis attached for clearance of the motor and weight. The dome was from the Hornby/ Dapol terrier spares supplied with the engines, and the front steps from the schools class kit. A whistle was sourced from the Jinty bodyshell. The engine was then painted in GER Royal Blue, from Phoenix Precision, with satin black used on the roof, and matt black on the running plate top and smokebox. The sandboxes, running plate sides, and drive wheels were finished in royal blue, with the buffer beams (both front and tender) finished in buffer beam red, also from Phoenix Precision. Lastly came the adding of a vacuum pipe for the loco front, and NEM couplings to the front and tender. The engine is near enough complete, but requires cabside number plates - on order from Narrow Planet, and GER lettering - yet to be sourced. I am going to hold off with the tender as I may be go about building a shorter (height wise) tender body as the B12 one is too tall for the engine. It has been designated the number of 268 (a J69 number, but modellers license and what not) and is classified as a J42, filling in part of the gap between the J41's and J45's. Here's a picture of the 98% completed model last weekend running with two repaints of the Bachmann Emily coaches. Your thoughts on the conversion would be most appreciated! *note* Yes I'm aware of the rather largeish bulge of filler on the top of the boiler by the dome, it's actually a mix of filler, and two boiler straps. Regards, and until next time! 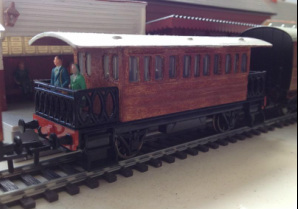 On my other thread for my OO layout, I posted pictures of a coach repaint in the form of a Bachmann Henrietta. The original outcome of it in Teak was abysmal, so it went into Deep Red (Purple Red/ Lake) instead, finished with a dark grey roof. Since then, last August, I have been contemplating repainting it into Teak once more, and following on from my two successful repaints of two Bachmann Emily coaches into Teak, I decided to give it another shot. I started by rubbing down the paintwork, and then applied a coat of grey over this. Once dry, I applied a coat of Phoenix Precision Teak Base (P995) and a further coat once that was dry. Then, once the second coat had dried, I topped it off with lightly stroked coats of Golden Teak (P997) and applied a coat of Revell SM 321 Grey White to the roof. The coach was completed this afternoon, at about 1pm, and has been finished with two passengers and a guard on each balcony end. Here's the coach together with my two Emily coach repaints, which will be finished as ECJS No. 's 76 and 77. Two more coaches will be added to this set over the coming months, in the form of a Clarabell conversion into a GNR saloon, No.103, and a second Emily coach as ECJS 79, which will become a brake end. No.103 will utilise the Emily coach chassis, with the original roofing being kept, and 79 will utilise Clarabell's chassis. Next up, will be a Bachmann Ben conversion into an LNER saddle tank. My plan on this is to finish it in Battleship Blue Grey, with nameplates, as per the mock up below. To start things off, I've now finished off the three ECJS coaches, and branded them. Further to that, I have added a fourth vehicle to the set, in the form of a Ratio GWR coach, that has been finished in plain brown. I've decided to keep it in this scheme as the build and paint quality when I recieved it was phenomenal. It has been finished as No.368 and is a 5 comp with 3 1st class compartments and 2 3rd class compartments. Following on from this, late June arrives, and so does a flurry of SR engines. Firstly, a set of HMRS presfix transfers turn up, allowing me to tackle the last stage of finishing off my Maunsell 350HP shunter, a Golden Arrow kits resin body on a Bachmann 08 chassis. Then an IOW terrier and half finished P tank turn up. The Terrier was only able to get it's numbers fitted, being W9. The P tank had it's body removed and primed, following the fitting of steps, and smokebox dart and lamp irons. The P tank was finished in unlined SR Olive green, as per the owners request, and numbered 1325. The completed P tank, with real coal fitted, and brass lamp irons too. A few days later, and a Wrenn R1 tank showed up, having been acquired following a swap at a model railway shop in Tooting. As soon as it was taken out of it's box, it immediately had several coats of Satin Black applied to it, to cover over the old transfers. Once this was done, Matt black was applied to the running plate, smokebox and door, and cab roof. The body then had transfers applied, and was numbered 1174. NEM couplings were fitted to the chassis, and test runs were made. Apart from the odd jittering, it seems that it prefers to be run with another engine at the same time. More Southern stock I hear you say? Yes, a fifth engine arrived in the form of a Tri-ang Maunsell L1, that was clearly well run. The body was immediately removed, and the tender discarded (it's in a drawer now) Brass lamp irons were fitted to the front, and the safety valves removed. The body was then primed, and once dry, received two coats of Satin Black. In the mean time, I had ordered a spare Bachmann N class tender, and a hornby B12/3 front wheel set, for use on the L1. When these arrived, the axles and wheels were swapped with those on the L1, following the realisation that the bar between the wheels block and chassis was shorter than the L1's original. The old large bar coupling was pried off and a bachmann NEM one was put in it's place. the wheels then received a coat of satin black, as did the tender body, with some of the lining still on it where thinners couldn't remove them. Once the paint had dried on the tender body, I applied the transfers to it, and numbered it 1782. A makeshift tender drawbar was needed so I acquired a small strip of plasticard, and cut off a section of a cotton bud tube, and painted the assembly satin black. this was then glued into place in the gap where the old drawbar used to be. The engine runs well, but because of it's over flanged drivers, doesn't like the track at times. It's currently awaiting a new set of drivers, and possibly a new motor too, to replace the old XO4 motor, which while it does the job, isn't half temperamental. That's all for now. Till next time!! I do like that Gresley teak coach, rather nice. That Loco 1325 looks almost as if it's winking at you in the photo ! All in all a nice collection, look forward to more photos etc. Firstly, thankyou Dennis for the kind words on the coach! Most appreciated!! Now, I have some bad news re the L1. Lastnight, the motor started spewing out smoke. I can only presume it's a goner going from the amount that actually came out of it. Is there any other motor that will fit the chassis, or will it be a complete redo of the entire lower half of the engine? Next, I have taken on some coaches from a friend for repainting into Olive Green. These include two hornby four wheelers - to be made into a close coupled set, a Triang clerestory brake end with a new roof being made too - to become an ex LSWR coach, and a Dapol LMS suburban brake, which will become a push-pull trailer. Any advice on the numbering of the sets for the push-pull one would be most appreciated, doesn't have to be an authentic set number at all. Evening chaps and chappettes! Been a while! Here's an update to what I've been doing modelling wise over the past week and a bit. Last week, I went looking for my three gresley teaks from the older Flying Scotsman set. Having found them in the loft, they were disassembled, and primed using Halfords grey primer. The latest of my short stock repaints - old Hornby Gresley coaches - is nearing completion! The first one was of the Brake coach, into teak, but finished as GNR No.90 - a 58ft 1 1/2in BCK. This one used a base coat of Humbrol 103 Cream, followed by a top coat of Phoenix Precisions P997 Golden Teak, mixed with Humbrol Satin cote. The result is a phenomenally lighter finish to that of my previous repaints! Much more in line with Hornby's super detailed teak finishes! This one will become an LNER finished one as a full third, however will be a fictitious modern mainline certified coach, and will carry the number 99359, in LNER style numbering. The transfers used will be HMRS LNER presfix ones. The final one, also a CK, will be completed as a GNR CK, No.2701, and will be the final addition to the short-short set. But more on that in days/ weeks to come! That's all for today, and probably this week! Top stuff, I've always been nervous about having a go painting teak, you do a very good job of it! How about moving this thread to the new workbench section, it needs populating! Excellent work Nathan. A pleasure to see such fine work. flying scotsman123 wrote: Top stuff, I've always been nervous about having a go painting teak, you do a very good job of it! How about moving this thread to the new workbench section, it needs populating! glencairn wrote: Excellent work Nathan. A pleasure to see such fine work. Thankyou very much guys, most appreciated! flying scotsman123, how do I go about getting the thread moved to the workbench section? Cheers! Press the report button on the first post of this thread, then in the comments section ask very nicely if one of the mods will move it. It's more likely to be noticed that way than just hoping a mod will come across a post in this thread asking. Thanks for the advice, it's now here in the workbench section! The teak effect looks really good and is a vast improvement on the original - I don't envy you doing that lining. I do have a suggestion for next time - why not apply the paint with a cocktail stick - I used to do this for aircraft canopies and it works quite well. skyblue wrote: The teak effect looks really good and is a vast improvement on the original - I don't envy you doing that lining. I do have a suggestion for next time - why not apply the paint with a cocktail stick - I used to do this for aircraft canopies and it works quite well. The third coach in this short set is currently being started. This time I'll be using Humbrol 110 Natural Wood as the base coat. The aim of this is to eventually have three coaches, each with different finishes. The fist having used Teak Base, the second having used Cream, and now this one using Natural Wood. Once completed, it'll be lined out in Blue, as will the BCK No.90, and finished as GNR 2701, a CK. Once completed as a set, and varnished again, the trio will be off to a friends layout for a period of time running on his layout's resident D49, 222 The Berkeley. The Pullman baggage car will soon have it's base coat of Humbrol 10 Brown applied, and then it'll be shelved until after Warley, where I'll be picking up the Pullman Umber paint, along with the transfers I need to complete it. I also need to acquire new bogies, which the BG i stole it's current ones from, are not. During this time, I'll be starting work on my final suburban coach, a ratio Midland Brake third, which will be finished in teak to match the other three coaches - ratio full first in LT&SR teak, Hornby Gresley CL, and Thompson BT. It will be finished as either a GCR brake third, or an ECJS one, and the aim of the set is to show the various types of teak bodied suburban stock used on the railways. That's all for now folks! I'll post some updates to 2701 when it's starting to come together! That's all for tonight folks! !